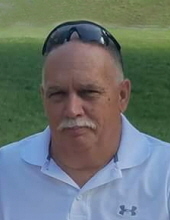 Michael Jeffrey Moore, age 57 of Danville, VA passed away Tuesday, November 27, 2018 at Duke Medical Center. He was born April 23, 1961 in Danville, VA to the late William Jefferson Moore and Lois Jean Adkins Moore. Michael was married to Karen Lee Shumate Moore who survives of the residence. He loved bowling, racing, golf, fishing, and building model airplanes and antique cars. Michael loved his family dearly and enjoyed traveling with them, especially to the beach. He was graduate of Tunstall High School and attended Danville Community College. Michael was employed for thirty-eight years at Goodyear Tire and Rubber Company. In addition to his mother and wife he is survived by a daughter, Tiffany Martel (J.C) of Danville; two sons Bryan Robertson (Desiree) and Jack “Thumper” Robertson III (Stacey) all of Danville, eight grandchildren, Makayla, Aayla, Aiden, Chloe, Gabriel, Daniel, Trinity, Holden Lee “on the way” and special friend, Gizzy. Funeral services will be held 2:00 p.m., Sunday, December 2, 2018 at Norris Funeral Services, Inc., West End Chapel, 511 Church Ave., Danville, VA, 24541 with the Rev. J.B. Baldridge and Rev. Butch Robinson officiating. Interment will follow at Danville Memorial Gardens, Danville, VA. The family will receive friends 12:45 p.m. till 1:45 p.m., Sunday, December 2, 2018 prior to the funeral services at Norris Funeral Services, Inc. West End Chapel and other times at the residence, 175 Walnut Creek Lane, Danville, VA 24540. Norris Funeral Services, Inc. and Crematory, West End Chapel, 511 Church Ave. Danville is serving the Moore family. Online condolences may be made at www.norrisfuneral.com. To send flowers or a remembrance gift to the family of Michael Jeffrey Moore, please visit our Tribute Store. "Email Address" would like to share the life celebration of Michael Jeffrey Moore. Click on the "link" to go to share a favorite memory or leave a condolence message for the family.